Sleep. Until you have to do without it, you don’t realise how good it is. If your child isn’t a great sleeper, you can go years and years without a decent night’s sleep. For the parents, this can get frustrating and pretty taxing, emotionally and physically. It isn’t doing the child any favours either. Lack of sleep can lead to symptoms of attention deficit hyperactivity disorder as the child tries stay focussed. There are lots of issues than can disrupt sleep and you can read about them here. The amount of sleep a child needs will vary, depending on their level of activity, their age, and their individuality. For a primary school age child, they are going to need between 10 and 12 hours per day. A good way to know if your child is getting enough quality and quantity of sleep is their demeanour in the morning. If you have to wake them every day, and drag them out of bed, or they are very cranky, chances are they need more or better quality sleep. First up, have a think about how much exercise, preferably outdoor, your child is getting. Kids need about 1 hour of exercise, through the day, not just before bedtime. This is highly variable however. Two of my kids fall asleep at the same time very night, it doesn’t matter if they have done nothing all day. The other child needs to have lots and lot of running around, or she struggles to get to sleep. Most parents I meet also need a bit more movement in their lives, so get out and get active with your kids for an hour a day. Everyone will benefit. Screens wreak havoc with bedtime. They make it extremely hard for kids to fall asleep. And, again, some kids will not be affected. Generally speaking, cut out screens for at least 2 hours before bed. So no TV or iPad after dinner. Instead, read books, do a puzzle, or just play. Of course, this also means that parents can’t be on their devices in the time between dinner and bed. Chamomile tea is a lovely soothing bedtime drink. Some children like it, and like the ritual of having a cup of tea like mum. If it is too bitter, add a touch of honey, but try to get your child used to bitter flavours as they have lots of benefits for gut health. Kids thrive on routine (although not all parents do!). Have a predictable routine every day, which starts at the same time. We accidently got into the habit of setting an alarm at 7pm when it is time to brush teeth (the alarm was actually to remind me to switch over my milk kefir, but it became the bedtime alarm!). Be firm, but kind. Anxious children may need a parent to lie with them. As long as it is for a reasonable length of time (like 5-15 minutes), this is fine. If it is for 3 hours, it probably isn’t fine. 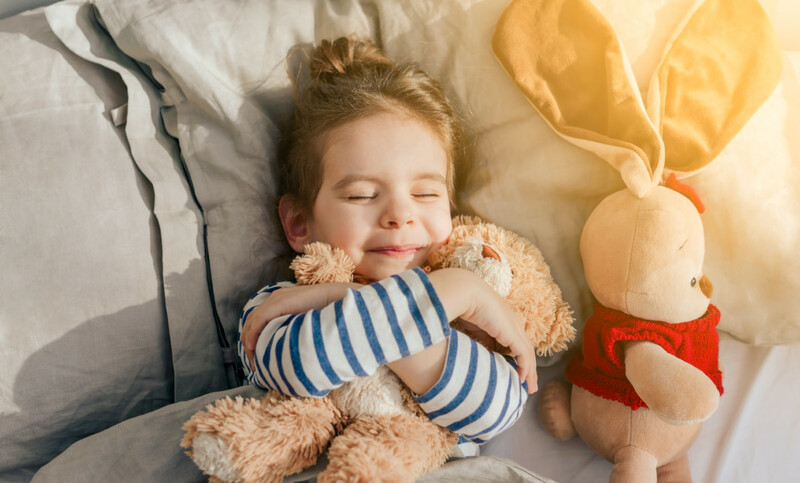 In my online course “Create Cool, Calm and Cooperative kids”, I take parents through a bedroom audit to see how their environment is affecting their child’s sleep, as there are lots of factors which disrupt sleep, but are really easily fixed. These contain an amino acid called tryptophan. The body uses tryptophan to make two neurotransmitters called melatonin and serotonin which help with sleep. These lovely brain-shaped nuts also contain small amounts of melatonin itself. These provide calcium to the body, which the body also needs to help make melatonin, which helps us sleep. I always noticed when my kids were babies that they slept much better on the nights they had fish for dinner. Seafood is a really good protein source, including the amino acid tryptophan. These contain melatonin and help kids get to sleep, but the catch is in the name. Tart cherries are tart! You can buy tart cherry juice, but not many kids would drink it. I have made it into ice blocks, and it definitely works, but giving a child juice every night is not ideal (but better than medication!). These can be helpful, but again they have to be whole grains. If your child has problems sleeping, you could give them a small bowl of porridge made with milk before bed. The oats need to be rolled oats, not quick oats. The carbohydrates from the oats and the calcium from the milk will help. This is a traditional way to help with sleep, the protein keeps your child’s tummy full overnight. This will help your child get to sleep and stay asleep. What about foods to avoid before bed? There is caffeine in chocolate, so it your child has a Freddo before bed, switch it for something else, like some natural yoghurt, or a small piece or cheese. Ice cream after dinner is a big no-no. The sugar will have them wired at exactly the same time they should be winding down. Doing a food allergy test can be a really good short-cut to improving sleep. You can book one here. If your child has issues with behaviour or sleep, I highly recommend doing my online course “Create Cool, Calm and Cooperative kids”. In this I guide parents on a 6 week journey to improve a child’s mood through food. There are lots of recipes, coaching videos, a closed Facebook group for extra support and handouts. Start your journey today!